If your spouse is currently living in Canada on a visitor visa, work permit or study permit, and you wish to never separate again in the future, it is best to sponsor your spouse. There are many Canadian citizens and permanent residents in Canada who have spouses that are foreign nationals that are currently living in Canada. Specifically, there are a lot of spouses that reside in Canada but wish to obtain permanent residency in Canada to live with their spouses. In order to sponsor them for permanent residency in Canada, the process is called an Inland Spousal Sponsorship. 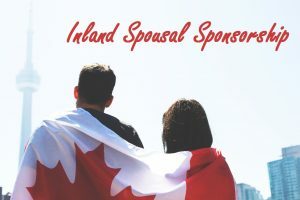 Therefore, in this article, I will address who is eligible to sponsor their spouse to Canada, what an Inland Spousal Sponsorship entails, and much more. Before you can sponsor your spouse in Canada for permanent residency, one of the most important factors to determine is whether you are eligible to sponsor your spouse in the first place. It is essential that you meet all of the eligibility requirements prior to applying to sponsoring your spouse in Canada. I have listed the eligibility requirements below in order for you to determine whether or not you can sponsor your spouse. You must indicate that you have an intention of living within Canada when your spouse gains permanent residency in Canada, especially if you are a Canadian citizen who is currently residing outside of Canada. On the other hand, if you are a permanent resident of Canada that is currently living outside of Canada, unfortunately, you will not have the option to sponsor your spouse to Canada. You must reside inside Canada before and during the application process if you are a permanent resident. Unfortunately, there are some circumstances that make a sponsor ineligible to sponsor their spouse to Canada. Therefore, it is essential for you to determine whether you are eligible or not before applying for an inland spousal sponsorship. There are several different circumstances that may make a sponsor ineligible to sponsor your spouse to Canada. The inland spousal sponsorship is meant for sponsored spouses are currently inside Canada on authorized status. Authorized status can be a Temporary Resident Visa, also known as a Visitor visa, a Work permit or a Study permit. As long as the sponsored spouse has authorized status within Canada, they may continue doing the activities set out in their permit or visa, so long as the visa or permit is still valid. Keep in mind, if visa or permit expires or will expire, it is vital for the spousal sponsorship application that they either apply for a new visa or permit or file an application to extend their stay. Another option, if the visa or permit has expired, is a restoration of status. It is important to remember that any immigration application decision is in the hands of the Immigration officer assessing the application and thus the sponsored spouse is not guaranteed to remain in Canada. An advantage of the inland spousal sponsorship is that the sponsored spouse may be eligible to apply for an open work permit while their application is being processed. By applying for an open work permit, the sponsored spouse may be able to work and provide for their family while the spousal sponsorship application is being processed. This would definitely help as the processing times for inland spousal sponsorships are lengthy. Additionally, an open work permit allows the sponsored spouse to work for any Canadian employer anywhere in Canada. Thus, they do not have to obtain a valid job offer prior to applying for this work permit, unlike the closed-work permit. The sponsored spouse may also apply for the open work permit at the same time as the spousal sponsorship application to save time. If the sponsored spouse is required to attend an interview, then the government of Canada will inform them of the date, time and location of the interview as well as any required documentation they may need to bring. If the spousal sponsorship unfortunately is refused, the sponsored spouse must immediately leave Canada once their visa or permit expires. Furthermore, if the sponsored spouse decides to travel or leave Canada at any point in time during the spousal sponsorship application process, there is no guarantee that the Immigration officer will allow them back into the country. This is especially the case if they require another Temporary Resident Visa if their current visa or permit had expired. Conclusively, the processing times for spousal sponsorships, for both inland and overseas spousal sponsorships, have become the same and have decreased substantially compared to years before. In December of 2016, the government of Canada had announced that the processing times have been changed and updated to 12 months (1 year). It is essential that you have met all of the aforementioned requirements before you attempt to apply for an Inland Spousal Sponsorship. Spousal Sponsorship applications are difficult applications to pursue on your own and it is highly recommended that you seek out professional and experienced help before attempting to submit the application. Here, at Akrami & Associates, we work and have experience with many different immigration issues. We have helped many of our clients reunite with their spouses in Canada and are now living permanently in Canada. If you believe that you may be eligible to sponsor your spouse for an inland spousal sponsorship, please feel free to contact Akrami & Associates at our office at 416-477-2545 for more information or if you would like to book a consultation with an immigration professional for more advice.